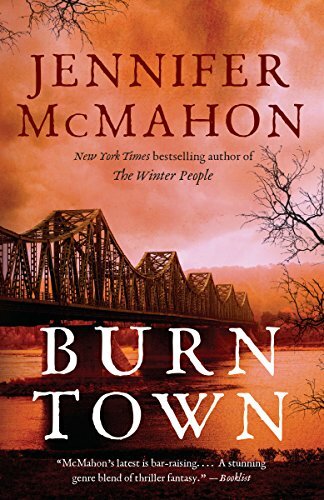 The major new novel from New York Times bestselling suspense writer Jennifer McMahon. Eva grew up watching her father, Miles, invent strange and wonderful things in the small workshop behind their house on the river that runs through their old mill town. But the most important invention of all was the one that Miles claimed came from the mind of Thomas Edison himself–a machine that allowed one to speak with loved ones long passed. Smuggled out of Edison’s laboratory, the blueprints were passed down to Miles, and he’s been using them to protect Eva, her mother, Lily, and her brother, Errol, ever since. Then, one night when a storm is raging and the river is threatening to flood, the machine whirrs to life on its own. Danger, it says. You’re in terrible danger. The next thing Eva knows is waking up on the side of the river and seeing her mother’s grim face. Eva’s father and brother are dead, their house has been washed away and an evil man is searching for them both. They need to hide. Eva changes her name to Necco–a candy she always loved–and tries to put everything in her past behind her as she adapts to her new life off the grid. But when her boyfriend is murdered and her mother disappears, she knows that the past is starting to catch up to her. What really happened the night of the flood? As Necco searches for the truth, her journey unites her with two women who are on desperate quests of their own. And as the trio follows the clues to solving the mystery of Necco’s past, they discover that sometimes it’s the smallest towns that hold the strangest secrets. I really wasn’t too sure what to feel about this book. It had everything I like about mysteries in it: an unknown villain, a plucky heroine, and a good cast of supporting characters. The only thing that this book lacked was a plotline that stayed engaging. I lost interest in the book after Hermes was killed and both Theo, Pru and Fred were introduced into the story. While I wanted to find out who Snake Eyes/Chicken Mask Man was and if Necco/Eva had the plans for the machine that can talk to the dead, I almost didn’t finish the book because I couldn’t get involved. I also didn’t like that there were so many points of view. If the author had just kept with Necco and Theo, I would have been fine with it. But you had Martin, Pru and Fred’s point of view added in. While I appreciated it, again, my focus was lost with so many points of view and I felt that it took away from the story. I also wish that the machine that could talk to the dead was featured more in the book. I was fascinated by it from what was described and I really felt that the author could have gone a whole different direction with the story if Martin hadn’t told Errol to destroy it. I did like Necco. She was so strong even when everything that she had been told by her mother ended up being all false. Honestly, that would have broken me. When it was revealed who Snake Eyes/Chicken Mask Man was and his ties to Necco, I was very surprised. I was only surprised because that character I assumed died. Don’t ask me why I assumed that because it was never mentioned. But that person was never mentioned in the book again, so I just assumed that person died. Guess I was wrong. The end of the book was your typical HEA with the mystery being blown wide open. Why: I just couldn’t connect with the characters or get into the storylines. I wish I did or else this review would be different….sigh. I’m sorry this one didn’t totally capture your interest. It definitely seems from the complex plot and tons of characters that it wouldn’t be for everyone. I hope your next read treats you better! Thanks :). Normally I wouldn’t have an issue with a complex plot but add in tons of characters, each with their own agenda, and my head started to spin.